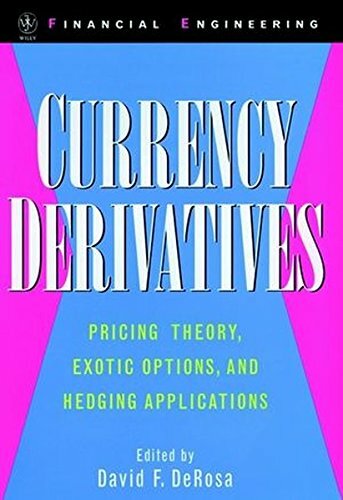 A groundbreaking collection on currency derivatives, including pricing theory and hedging applications. "David DeRosa has assembled an outstanding collection of works on foreign exchange derivatives. It surely will become required reading for both students and option traders. "-Mark B. Garman President, Financial Engineering Associates, Inc. Emeritus Professor, University of California, Berkeley. "A comprehensive selection of the major references in currency option pricing. "-Nassim Taleb. Senior trading advisor, Paribas Author, Dynamic Hedging: Managing Vanilla and Exotic Options. "A useful compilation of articles on currency derivatives, going from the essential to the esoteric. "-Philippe Jorion Professor of Finance, University of California, Irvine Author, Value at Risk: The New Benchmark for Controlling Market Risk. Every investment practitioner knows of the enormous impact that the Black-Scholes option pricing model has had on investment and derivatives markets. The success of the theory in understanding options on equity, equity index, and fixed- income markets is common knowledge. Yet, comparatively few professionals are aware that the theory's greatest successes may have been in the derivatives market for foreign exchange. Perhaps this is not surprising because the foreign exchange market is a professional trading arena that is closed virtually to all but institutional participants. Nevertheless, the world's currency markets have proven to be an almost ideal testing and development ground for new derivative instruments. This book contains many of the most important scientific papers that collectively constitute the core of modern currency derivatives theory. What is remarkable is that each and every one of these papers has found its place in the real world of currency derivatives trading. As such, the contributing authors to this volume can properly claim to have been codevelopers of this new derivatives market, having worked in de facto partnership with the professional traders in the dealing rooms of London, New York, Tokyo, and Singapore. The articles in this book span the entire currency derivatives field: forward and futures contracts, vanilla currency puts and calls, models for American exercise currency options, options on currencies with bounded exchange rate regimes, currency futures options, the term and strike structure of implied volatility, jump and stochastic volatility option pricing models, barrier options, Asian options, and various sorts of quanto options. If you have any questions about this product by David F DeRosa, contact us by completing and submitting the form below. If you are looking for a specif part number, please include it with your message.